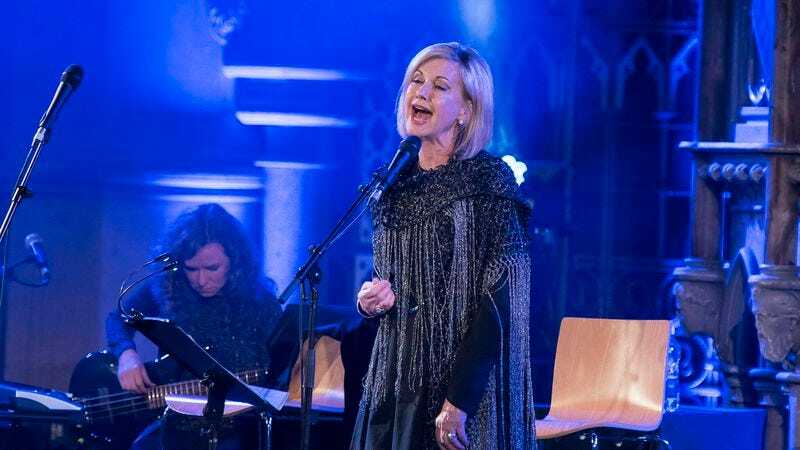 As reported by the Associated Press, Olivia Newton-John has announced that she’s canceling her current tour so she can get treatment for breast cancer. Newton-John said she originally assumed she just had regular back pain, but in a statement on her Facebook page she says she recently discovered that it was actually “breast cancer that has metastasized to the sacrum.” The Facebook post goes on to say that she’ll now be undergoing a “short course of photon radiation therapy” at the Olivia Newton-John Cancer Wellness And Research Centre in Australia, and she hopes to return to touring by the end of the year. In fact, the Facebook post says that rescheduled tour dates will be announced “in the coming weeks,” so she seems optimistic about this. Newton-John was originally diagnosed with cancer in 1992, and a BBC story notes that she’s become a “prominent campaigner” for other people battling cancer since then. She helped fund the Olivia Newton-John Cancer Wellness And Research Centre by taking part in a sponsored charity walk along the Great Wall Of China alongside Joan Rivers and British pop singer Cliff Richard.